This year’s EDC will be first time that the Las Vegas festival has offered camping — so with such a big change the festival’s organisers have today begun to flesh out their plans of what camping out at EDC in the Las Vegas heat will be like. So with that in mind, Insomniac have today revealed a whole swathe of information on its camping plans and have even released a full map of what the camp site will look like come this May. The festival’s organisers have recognised that modern festival-goers want some creature comforts and have announced the ability to camp in air conditioned tents — which is a really nice touch. They’ve also announced that there will be a central hub, dubbed The Mesa, where there will be an oasis pool, food stalls and other forms of entertainment and activities to keep festival-goers entertained during the quieter moments. They’ve also revealed that campers will be able to access the campsite via special entrance which should speed up the process of arriving and leaving the site. 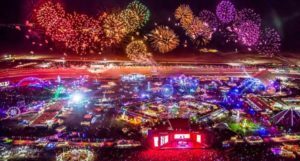 EDC 2018 will be taking place between 18th – 20th May after the festival’s organisers decided it would be a lot cooler for patrons than running the festival at the height of summer after a number of people suffered heat stroke in recent years.